The No. 6 Huskies begin the season possibly the biggest opener in program history against No. 9 Auburn. We take you through the whole schedule game-by-game. In what might be the biggest opener in program history, UW has a chance to go into SEC country and prove against a top-10 opponent that it is a serious national-title contender. Top Dawgs: Can Jake Browning and Myles Gaskin win a title and go out as UW's best class ever? Perhaps the most overlooked matchup on the Huskies’ schedule this year, Utah is one of the favorites in the Pac-12 South and should again have one of the league’s toughest defenses. Huskies played their worst game of 2017 against the Sun Devils in Tempe (a stunning 13-7 loss), and there will be a lot of unknowns with ASU under first-year coach Herm Edwards. The Huskies host BYU for the first time since the controversial ending to the 2008 game in which Jake Locker was flagged for excessive celebration after his TD run with 2 seconds remaining. BYU won 28-27. The Chip Kelly is back in the Pac-12, but it figures to be a bumpy year for the former Oregon coach. UCLA returns just eight seniors off a team that went 6-7 in 2017. Jake Browning made his point, all right, in Eugene two years ago, accounting for eight touchdowns (six passing, two rushing) in the Huskies’ 70-21 victory over the Ducks at Autzen Stadium. He’ll try to lead UW to its third straight win over its biggest rival. Huskies have won eight in a row against the Buffaloes, including a 37-10 victory in Boulder last year, and Colorado lost most of their offensive talent from 2017. 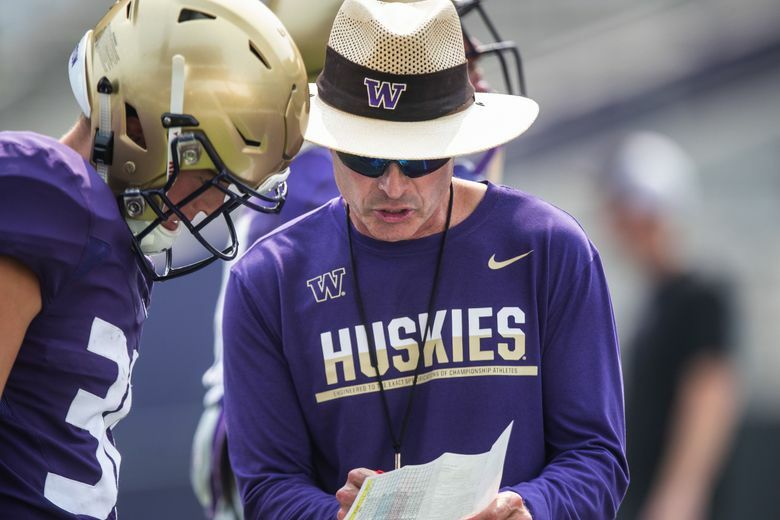 The Bears were one of the Pac-12’s biggest surprise in 2017 under former Washington defensive coordinator Justin Wilcox, a Chris Petersen protégé. With Bothell High product Ross Bowers back at QB, Cal looks like a good bet to get back to a bowl game. Game of the year in the Pac-12? It’s Chris Petersen vs. David Shaw, Myles Gaskin vs. Bryce Love, with Pac-12 North supremacy and a potential playoff berth on the line. Stanford knocked off the Huskies in Palo Alto last year. Huskies thumped No. 7 Stanford at Husky Stadium two years ago. Coming off their first bye of the season, the Huskies (cheap shot alert) get another bye when they welcome the Beavers in Jonathan Smith’s return to Husky Stadium.